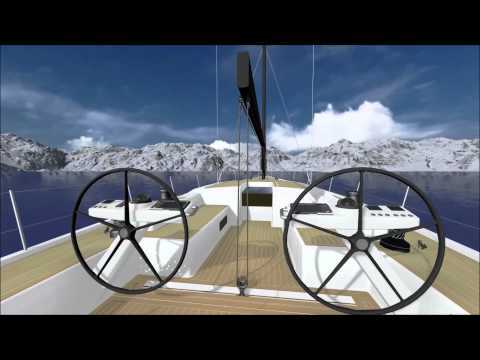 ICE Yachts, the new brand in the yachting industry, has introduced the ICE 62 on the market. A fast cruiser built for enthusiastic and competent yacht owners, who seek intense emotions and fun at the helm of a yacht with a high quality construction. The ICE62 is a very modern yacht with outstanding performance, comfort on board and excellent sea-keeping qualities..
From the hydrodynamic point of view, the hull’s waterlines, the “T” bulb lifting keel (2.50-4m) and the deep rudder guarantee high performance, with impressive "numbers" underlining the up-wind character that is matched by the surfing potential when sailing down wind. This demo yacht has an impressive option list: hybrid carbon hull and deck, lifting keel, carbon mast, bigger engine, state-of-the art domotics with a CAN bus electric system, etcetera. With all her options she would list at 1.996.460 euro normally. We can now offer her to our clients for only 1.600.000 euro. She is immediately available for inspection and sail trial in Italy.